I keep machine quilting for my customers and then forget to ask if I can post photos. Well this past weekend David Taylor came to get this Bright and Beautiful Flying Geese quilt of his. And I remembered to ask. 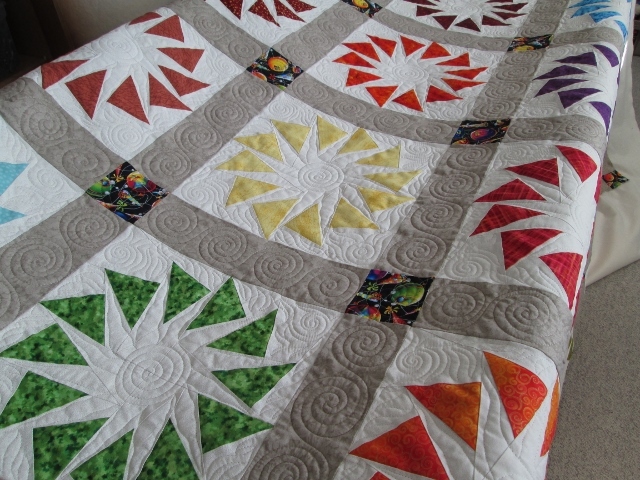 I just love this quilt because it is a rainbow of colours. 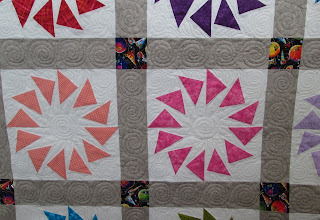 A detail of the machine quilting I did. I love what I did on this quilt so much I might had to make one. 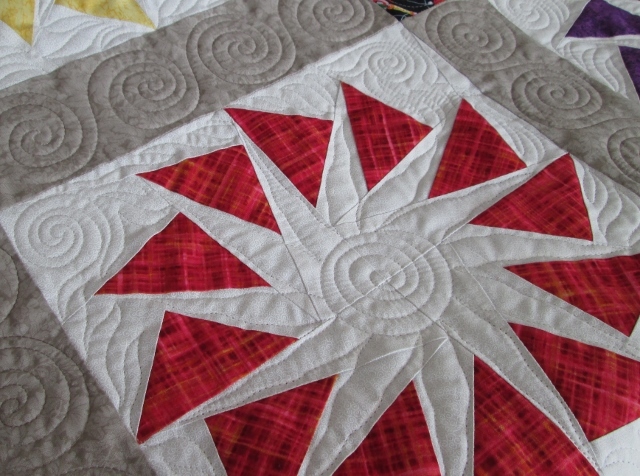 The inside of the block has this sunshine like pattern and the outside is a few spirals and more flame like stitching. It is all done by free motion so if I look closely I can see small changes with in each block. I believe David found the pattern for the block on the internet. The block is paper piecing done in four parts. I believe I have seen this pattern but not sure where. I am sure I will find it again. Edit note I have found the free pattern called Circle of Geese by Beth at Piece by Number. Lovely quilt and wonderful quilting! Wouldn't that be a great pattern for the Rainbow Scrap Challenge. What a great piece! I love the floating Flying Geese! Wow! Might have to track that one down and try it too. I love it. The pattern and the quilting are both great. Yes, I agree, this would be good for the RSC...love the quilting on this quilt.. I love how you did the spiral star in the background...very clever! You might want to check out the other free patterns I offer on the site, too!